After rating hundreds (yes, hundreds) of Flash-laden, non-mutable, overdone sites, we bring you some of the worst, and a couple that got it right. Gordon Ramsay usually reserves his famous catchphrase for the chefs who foul up dinner service on Hell’s Kitchen, but we’d like to propose another fitting application. After spending a few sanity-testing days evaluating Toronto’s ego-driven, Flash-laden restaurant websites, borrowing his words seems like a good way to slap some sense into this city’s restaurateurs. Last week, Slate posted an article on the general suckiness of restaurant websites, arguing that the worst are usually the ones that try too hard to bring the “entertainment experience online.” Intrigued, we decided to use the dos and don’ts from that post and lessons from other sharp critiques to see how the online properties of Toronto eateries fared. For our experiment, we reviewed the websites of Toronto’s 500 priciest and best-reviewed establishments, as rated by Yelp. Why the most expensive and best-reviewed? Well, we wanted to make sure that the restaurants we were scoring were a) popular, b) well-off, and c) in need of a website. The point here isn’t to go after Grandma’s Old-Timey Pierogi Shack for the Geocities-style page her grandson built for her. No, we’re critiquing the restaurants that spent time and money on their Flash-bloated monstrosities and should know better. For our grading criteria, we picked six desirable and six undesirable features. First, the good. In our view, a well-designed restaurant website should feature 1) contact information, 2) easy-to-access menus (preferably with prices), 3) hours of operation, 4) location (along with a map), 5) a reservation system (or a link to a third-party system), and 6) a visually appealing design. We also tested the sites to see if they worked in a mobile environment. Not exactly a steep set of criteria, or so we thought. On the flip-side, we penalized sites for having 1) a Flash or video introduction (minus a billion for not having a skip button), 2) a Flash interface, 3) PDF menus, 4) music or sound effects, 5) a generic introductory message, and 6) an irrelevant or douchey photo gallery. Our first mistake: not developing enough negative criteria. It seems that Toronto’s restaurateurs have been working overtime with Satan’s web designers to whip up new and terrifying features. As one might expect, going through 500 websites is a time-consuming process. And it was made all the more tedious by the number of sites with separate landing pages and Flash menus that took days to load. Also, for reasons we don’t quite understand, restaurateurs love pop-ups, auto-resizing windows, and moving buttons. Oh, and Papyrus, because nobody uses that font, so that makes it exclusive. Of course, after working through so many sites, patterns start to emerge. For starters, Yorkville and the Danforth were home to some of the worst sites, while the Annex and the Ossington & Dundas area were home to some of the best. Basically, the swankier the neighbourhood, the worse the sites. Overall, T.O.’s priciest joints fared rather poorly. Not a single restaurant on Yelp’s list of Toronto’s most expensive met all of our positive criteria, and it was only once we started looking at the city’s cheaper eateries that quality noticeably improved. 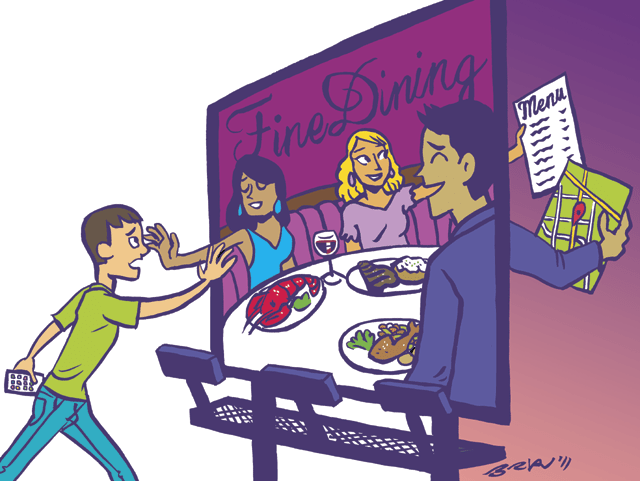 Other notes: restaurants that turn into clubs have lousy websites—dine.TO or MenuPalace.com tend to heavily rely on overblown Flash menus. Now, without further ado, Toronto’s worst restaurant websites.